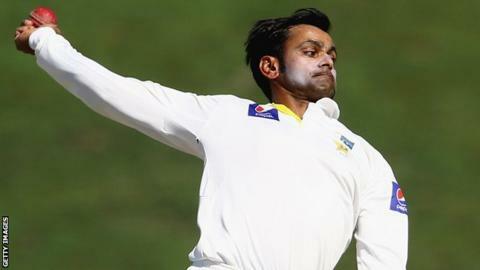 Pakistan off-spinner Mohammad Hafeez will fly to England next week for tests after he was reported for a suspect bowling action. He was reported during the first Test against New Zealand in Abu Dhabi last week - which Pakistan won by 248 runs. The 34-year-old all-rounder will be tested at Loughborough from Monday, the Pakistan Cricket Board confirmed. Under International Cricket Council regulations, a bowler must be tested within 21 days of being reported. Hafeez, who has played 39 Tests and 149 one-day-internationals, was dropped from the current second Test with New Zealand because of a hamstring injury he sustained after his action was reported. He was named in the ICC ODI team of the year earlier this month. Pakistan team manager Moin Khan said if declared fit, Hafeez will return to the squad for the remainder of the Test and ODI series in the UAE. Hafeez, whose action was also reported during a domestic league game in India in September, could be suspended from bowling in international matches if he fails to clear the test. Fellow Pakistan spinner Saeed Ajmal is currently suspended after he failed a biomechanic test in Brisbane in September.